Exhibition Spice of Life. 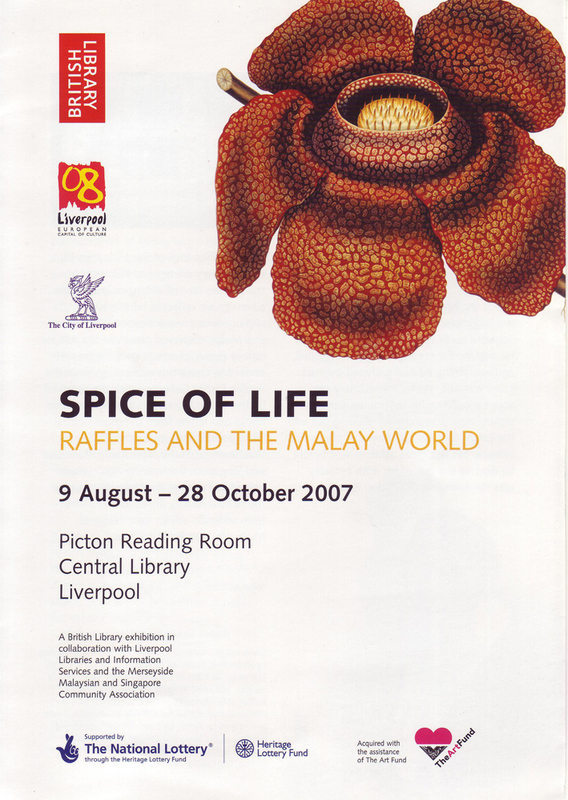 Raffles and the Malay world. But at the heart of his scholarly legacy is a tragic black hole. When Raffles left Sumatra for England in February 1824, his ship the Fame caught fire and exploded, and everything he had gathered over six years was lost. Yet he immediately set about rebuilding his collections, commissioning new drawings and sending out into the jungle for new specimens of plants and animals. His last great achievement before he died on the eve of his 45th birthday was the founding of London Zoo. Raffles's deep love of the Malay world, extraordinary energy and indomitable spirit in the face of almost unimaginable adversity are reflected here in his private and official correspondence in English and Malay, displayed alongside the natural history drawings which were his greatest pride. Manuscripts and drawings from the Raffles Family Collection recently acquired by the British Library are shown alongside books and letters from Liverpool Central Library and Liverpool Record Office. Volunteers from the Merseyside Malaysian and Singapore Community Association helped to interpret the Malay letters, and the natural history drawings benefited from scientific advice from National Museums Liverpool. Source: Text extracted from the introductory leaflet by Dr. Annabel Teh Gallop. See for a list of all twenty-eight exhibits here.